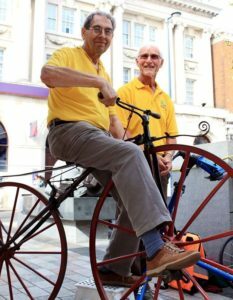 Put your foot to the pedal and get down to the Maidstone CycleFest this weekend. Kent County Council is once again supporting the event with information about its cycle training programmes. Staff will also be on hand with an exhibition and information on the new cycle route along the Medway Towpath launching later this year. CycleFest runs between 10am and 4pm on Saturday, May 13 at Jubilee Square, Maidstone and is free. Kent County Council offers free bicycle training for children and adults. It is aimed at building confidence in how to cycle safely to improve health, the environment and to provide an alternative to many short car journeys. CycleFest will see the return of the popular Cycles UK Turbo Time Trial where people can win prizes for the fastest man and woman by testing their stamina and cycle power. Test your stamina by making a smoothie using pedal power and exercise those little grey cells with a competition to guess the bike part. For more information visit Explore Kent.